It's 7 Days To Go... We Are So Excited!!! 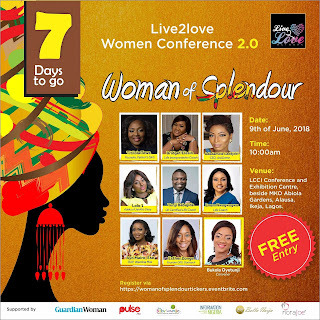 Live2love Women Conference 2.0 #L2LWC2018 is 7 days to go. We are sooooo excited It's almost here!!! We are certain that great things are bound to happen. Our participants are set to experience liberation. They will experience a positive turn around. Emotional and psychological health will be restored. Our participants will be encouraged to do exploits. They will know exactly who they are and their self esteem will be boosted. 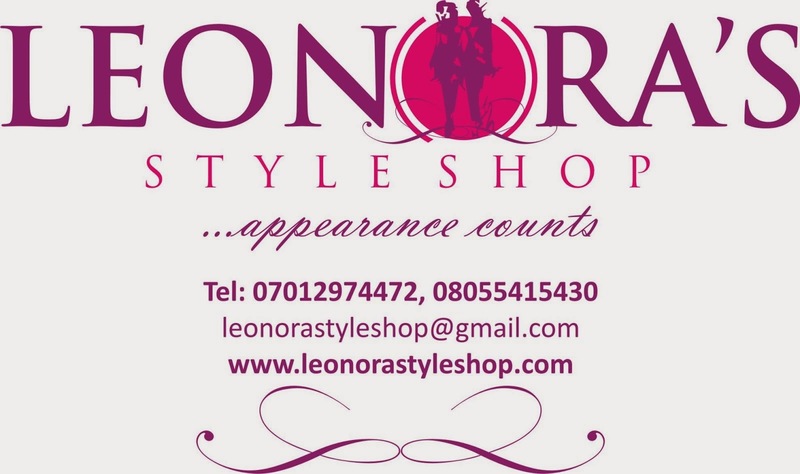 Our participants will confidently radiate so much SPLENDOUR. Their glorious light will shine so bright that that they will be singled out for greatness. 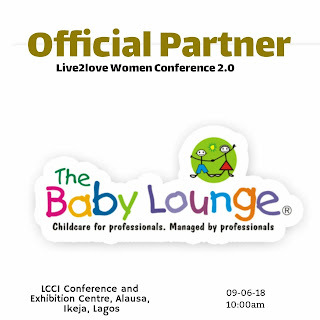 Remember that we have got your kids covered with a POP UP CRECHE by the Baby Lounge. Come experience a 360° revitalization. Woman of Splendour is Barely 8 Days to Go... Have You Registered? 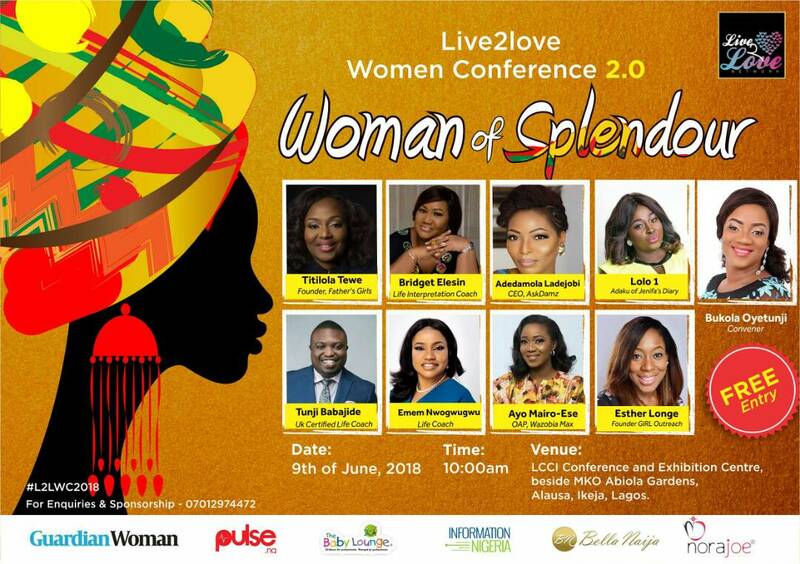 Live2love Women Conference 2.0 #L2LWC2018 is 8 days to go. WOMAN OF SPLENDOUR: 9 Days to Go!!! Great things are bound to happen. Women are set to experience liberation. Stories will be changed for better. Women will be encouraged to do exploits. They will know exactly who they are. Women will radiate so much SPLENDOUR. Their light will shine so bright that their problems will go into extinction. 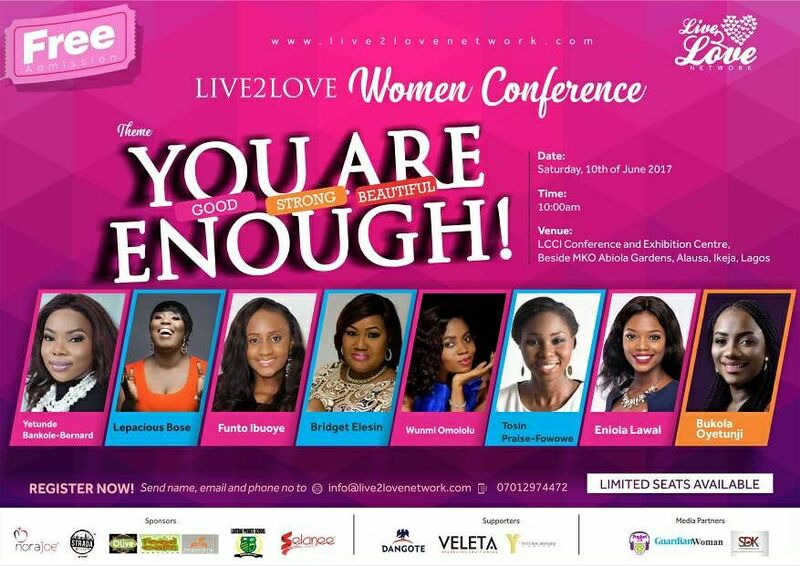 Do you want to be at a gathering of women who are ready to make impact on lives, homes and the nation as a whole? Or you want to discover exactly who you are and what you were created for? Do you think it's high time you began to understand how important it is that you put all the ideas, skills, talents, initiatives and vision you've got to appropriate use? If you answered YES to these questions, then you shouldn't miss WOMAN OF SPLENDOUR come 9th of June, 2018 at LCCI Conference and Exhibition Centre, beside MKO Abiola Gardens, Alausa, Ikeja, Lagos for 10:00am prompt. 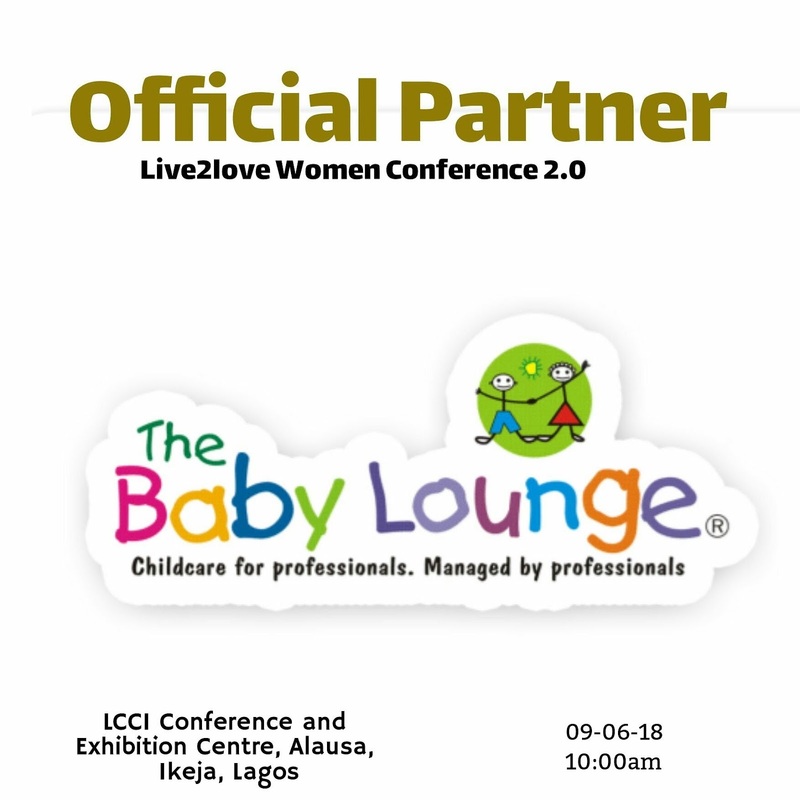 Good news is that this conference is FREE and to top it all, you have a well equipped Pop-Up Creche courtesy The Baby Lounge, for your lovely little ones #NoExcuses. Interested in sponsorship or having a booth set up at the conference? 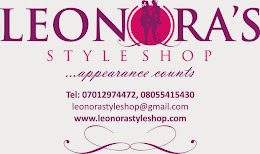 Pls call or send a WhatsApp message to 07012974472. 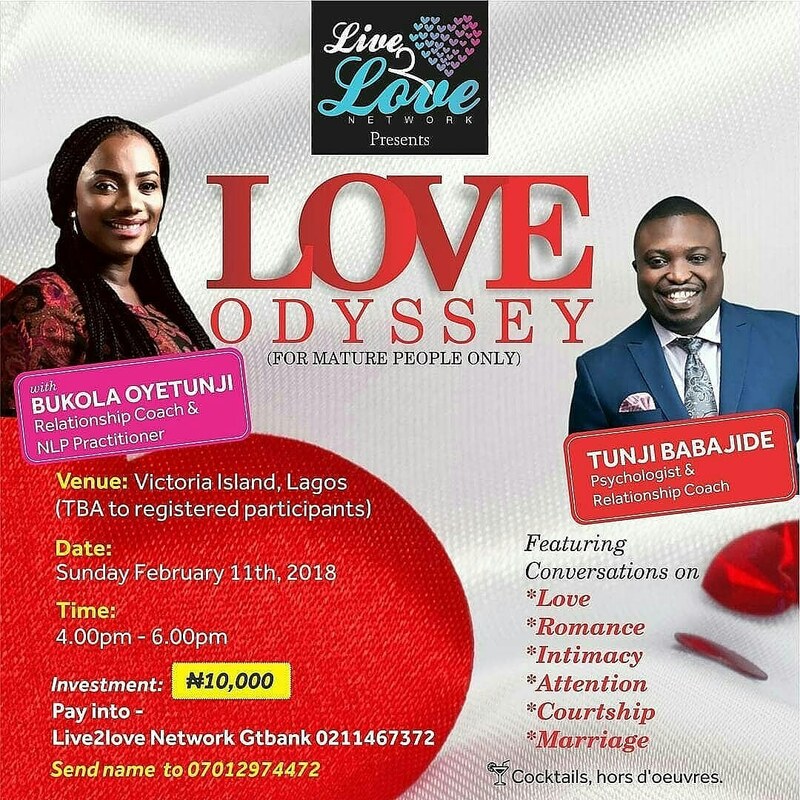 LOVE ODYSSEY 2.0 .... Come rediscover LOVE again! Love, who doesn't want to be loved? 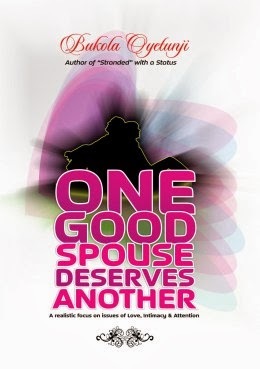 Who doesn't want to have a healthy marriage where intimacy, care and attention resides? When you are adequately loved, it gives you the power to achieve extraordinary feats. Love is the principal thing......It makes the world a better place. 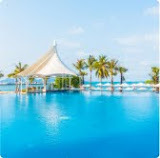 LOVE ODYSSEY is an event where 2 Certified Life/Relationship Coaches take you on a journey of rediscovery in a very romantic and relaxed atmosphere. 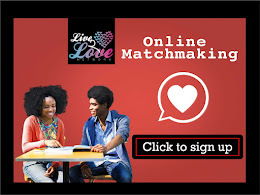 We help you discover how to bring back the fire of intimacy into your relationship. We help you discover the true meaning of love ❤💘and how to give it to your partner without barriers. Attend LOVE ODYSSEY and you are bound to experience an all round fulfilment in 2018 and beyond. 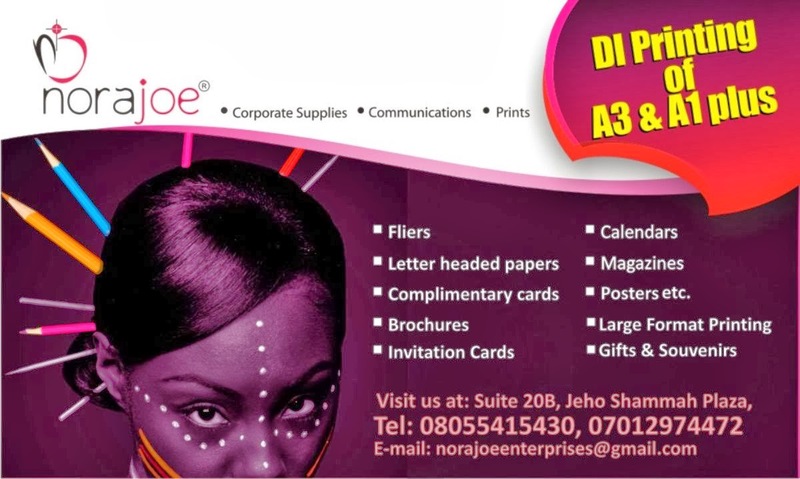 Pls check attached flyer for more details. 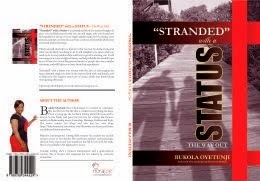 Good news for Singles who are ready for marriage, engaged or hoping to be married/engaged anytime soon. There are some things you have to be sure exists in your relationship, there are also some qualities you have to be very certain your future partner possesses. There are some discussions you must have before going into marriage or even before accepting that proposal. As a partner too, there are some things you have to work on personally psychologically and emotionally so you can be a balanced Spouse. Relationship Masterclass: BEFORE YOU SAY I DO is the right place to be, come 16th of December, 2017. 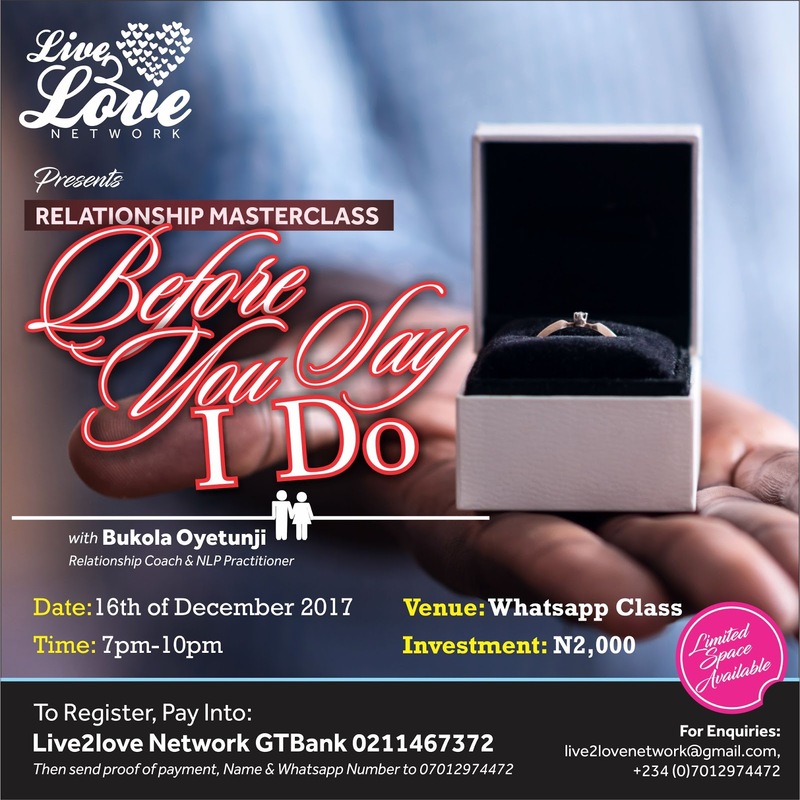 This masterclass will enlighten you on all the things you need to put in place before walking down the aisle with that man or woman. It will also help you let go of some unrealistic standards so as to focus on the more realistic expectations you should have about marriage. This relationship masterclass will lead you on the path towards having a fulfilling and a happy marriage. It will also educate you on how to work hand in hand with your partner in order to have a great future. Lastly and most importantly, after attending this masterclass, you would be empowered to know for sure if that man/woman is actually the right person for you. What are you waiting for? Register now so you can experience 3 hours of realistic Coaching with Trained Life Coach and Neuro Linguistics Programming Practitioner - Bukola Oyetunji. She would love to share her wealth of knowledge, experience and training with you. Look forward to having you in class.